There are small things that make such a big difference in our lives. We usually sit in the dark in the evenings because there isn’t enough power to turn on our overhead lights or because there is no power at all. But!!!! Today Mark and our friend Eric upgraded some key lights to be more efficient. As we sit here and the power goes on and off it is okay because our lights come back on with the power! Yay! Our lives have changed and our evenings will be a bit brighter. Here is the difference from one night to tonight. 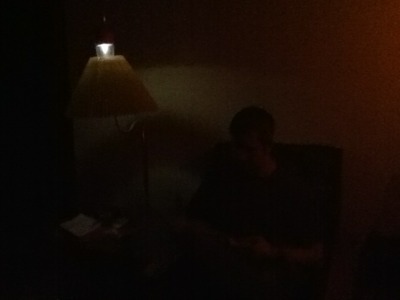 This is Mark reading to the light of candles and a solar lamp. 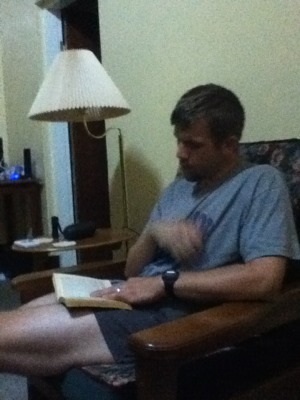 Here is Mark reading tonight! Tonight we are happy to have good lights!